Sorry, Keith. Another one's gone sideways. It looks like he's having a snack while watching TV. Haha. I think I like it better that way. It was painted well before Bacon was born. Goya painted it on his dining room wall, allegedly. Saturn is eating one of his children. Had a look at the original. I'd say well done. I think you got the feel of it, especially the expression in the eyes. Still not quite sure about the left arm, something looks odd about to me. I noticed that as well but decided to leave it as I'd drawn it because I thought it was funky. Warped just like his mind. The latest by Keith. It's called Bloomsbury Triangle (a study in the style of Francis Bacon). I hope I got that right. I think it's very cool. I think it would be a good album cover. Join the club, I have the same reaction to Bacon's paintings. Unsettling and intriguing at the same time. 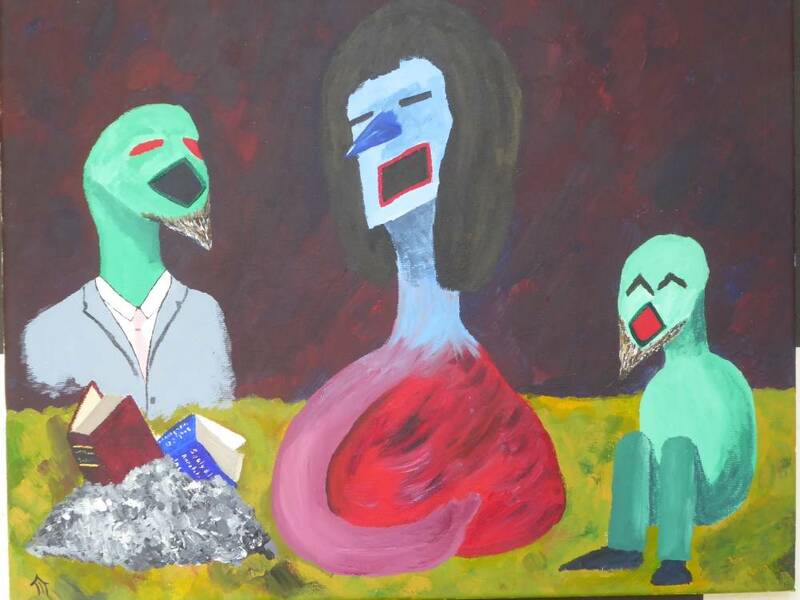 The paintings my reaction to my former boss' boss being declared surplus and facing redundancy. Thanks for more back-story. I can relate to redundancy ... seems to be lurking around the next corner almost all the time and inspires "unsettling" for me. That's why I paint harpsichords. I'll never be redundant. Sorry if you're worried about your job security. I know that's nothing to joke about. But I suspect you can do anything you put your mind to. We've all seen that here. So perhaps rather than be worried, you should start thinking about what you'd love to do next, and start preparing. Maybe it could be a good thing. Sound engineering, maybe? Or rock star? Here's my most recent painting. It's gouache on spruce. 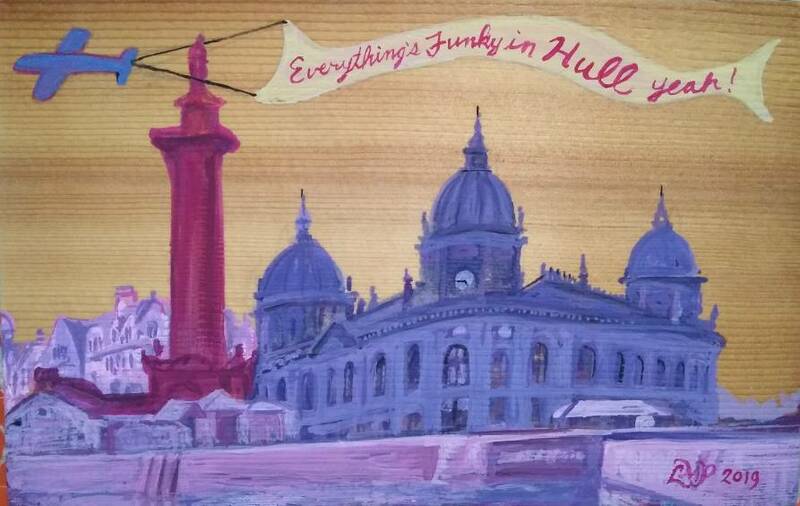 I made this before realizing I was going to Hull, and discovered everything is indeed funky there. No joke. I loved it. As an American, I felt very exotic when some cheeky little kids called me out from my accent. One of them offered to buy me for $1.05. I think that might be about the right price for me, but maybe $1 too much. Haha. But what a cool city. I got to see the building, which I'd painted from a photograph as a gift for Keith and his wife. They also took me to the home of the man the statue is of, so that was really cool, but kind of depressing. We walked around old town in the wind, saw the river, saw where the hull of the bounty was built, went to the art museum, and later saw a football match, where city won! I got a good taste of the city. I can see why Keith loves it there and calls it home. Keith and I also got to play together, and managed to get a song started, which hopefully will end up as something we can post soon. Sounds like a fine old visit, Lynn. Like the painting. Interesting effect painting it on wood.